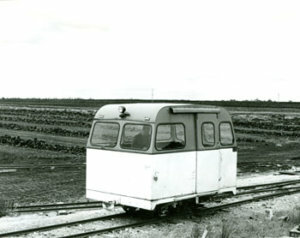 This railcar is used on the larger bogs by the Manager or authorised members of his staff, to make inspection tours of the bog. It is always held in readiness, complete with first-aid equipment as a bog ambulance. The car has a heavy underframe carried on two sprung axles. The wheels are machined on the rims and shock absorbers are fitted. The axles are powered by a water cooled petrol engine, automotive clutch, change speed gearbox, special reduction/reversing gear¬box and final chain drive to each axle. The cab has an angle iron frame work, panelled with steel sheet and glazed all round. The door is sliding type. Beam lights and electric windscreen wipers are fitted at each end and a short-wave radio transmitting and receiving set enables the occupants to keep contact with workshops and the larger machines on the bog.